It’s 8am on Saturday morning and I’ve just arrived at the gym to try Sh’bam which is billed as a fun, sociable dance class. I love dancing and want to inject more fun in my life so what could possibly go wrong? It turns out regular classes are cancelled today because it’s a Hawaiian themed open day. Which explains why a man in a multicolored faux grass skirt and a bra made from two coconut halves has just arrived. It’s a bit odd but all is not lost. Instead of the regular gym program they’re running a sample of classes back to back with a different one every 30 minutes. The Sh’bam class isn’t on until 9am so instead of going home first I decide to try whatever else is on offer too. I haven’t had any breakfast so I grab a complimentary protein ball which tastes of peanut butter and something vaguely metallic, before going to the first class. I end up staying for 90 minutes and doing three classes: Bodycombat, Body Jam and Sh’bam. They’re all Les Mills classes with fun music, good choreography and enthusiastic instructors but I’m just not feeling the vibe. It’s not them, it’s me. I’ve been sleeping badly all week because I’m supposed to leave on a press trip to Zimbabwe tomorrow but I still haven’t got my tickets. This trip means more to me than any other travel I could do because I left a piece of my heart in Zimbabwe 20 years ago and it’s time I went to pick it up. I was a teacher in Zimbabwe for a year and I want to see my favorite pupil again. Sunwell was 10 years old the last time I saw him, a cheeky boy with a beaming smile who squeezed on a small bench for my lessons with his best friend Bernard. They were the children of subsistence farmers in rural Zimbabwe in 1992, a year of drought, their future unsure. I never told Sunwell , or even met his parents, but I always wished I’d adopted him then and taken him away with me to a brighter future, a world of choice which sparkled like his smile. Now Sunwell has three children of his own and lives in Zimbabwe’s capital city Harare but Bernard is ‘late’ as they say in Zimbabwe. I do not like to think what a young man like him could have died of and I dare not ask. I still think about Sunwell, I still worry about him and I still wish I’d taken him with me. But I was too young, too selfish, too uncertain about my own future. When I lived in Zimbabwe it was one of the most prosperous countries the region, known as the bread basket of sub-Saharan Africa, but the decades since then have not been easy. Now I’m thrilled to be invited to revisit Zimbabwe after being invited by the Zimbawean Tourism Authority but I’m also worried about the trip because I will be so far from home and may not be able to communicate with my family. It’s a long journey and I know it will be emotional seeing Zimbabwe and Sunwell again after all this time. I’m annoyed with myself because the class is fun, the instructors are laughing and everyone is getting into Sh’bam while I’m stuck in cycle of worry, negative thinking and rumination. But the very worst thought is that I might not get to revisit Zimbabwe at all. That I may never see Sunwell again. So I hate myself right now for worrying about my first world problems when other people are struggling to feed and clothe themselves and their children. I keep dancing and I keep mindfully directing my attention away from my African dream and back to the here and now but it never sticks. “I just wanna feel this moment,” Christina Aguilera sings as I shuffle my feet, wave my arms and do my best to follow the Sh’bam moves. And I can feel this moment with all its physical and emotional challenges. Then suddenly Sh’bam is over and it’s time to go home. I eat another protein ball on the way out but if leaves a bitter taste in my mouth. UPDATE: I’m going to Zimbabwe! My tickets arrived so as you read this I will be in Harare as a guest of the Zimbabwean Tourism Authority. I will be attending and speaking at the Sanganai/Hlanganani World Travel and Tourism Africa Fair as well as going on safari, hopefully to Mana Pools National Park. Nothing could make me happier than this opportunity to revisit and promote Zimbabwe because it’s one of the most amazing travel destinations I’ve ever visited so I can’t wait to share my experiences with you. Stay tuned here for blog posts on Zimbabwe and follow me on Facebook, Twitter and Instagram for (Internet permitting) live updates from my trip. You made it! Have a super trip and enjoy revisiting your ‘youth’ in a magical part of the world. I’m so happy for you, Annabel! Who cares about Sh’bam. Zimbabwe here you come! Oh travel safe… I have so many friends there. Really wish you could stop by Cape Town… would love love to meet you!!! Not to mention Cape Town Tourism is awesome!!! Travel safe and hold onto your heart, bless you for going back and not forgetting those that are so dear to you…. 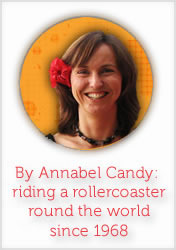 Travel safely Annabel and then tell us all about it… and I’d love to read more about your year there in 1992. It’s very confronting when our first world problems come face to face with the Real World…. would love to hear more of your thoughts on this. Your article made me want to go to Africa and do a feeding program and teach some people to work online. You are lucky to be a guest at Zimbabwean Tourism Authority. Once I travel the 7 continents, I will also do charity works. Thanks for being an inspiration. So glad you got inspired. I’ll ask Zimbabwe Tourism Authority about voluntary tourism opportunities here :) I know that’s hugely popular and is something I’d love to do with my family.